Play Scrolls of Ra | Top Online Slots | Join Wicked Jackpots! Experience the grandeur of the Ancient Egyptian civilisation with Scrolls of Ra Slot at Wicked Jackpots! It is brought to you by iSoftbet, made up of 5 reels and 20 lines. Please your eyes with the golden design and beautiful interior of an Egyptian temple. On each side of the reels, you can see 2 pillars covered with hieroglyphs of all kinds. Find various symbols on the reels such as a Raven, Sun, Ankh, Sandstone Artefacts, Kneeling Woman, A, K, Q, J, 10 and 9. Let yourself be carried away by a traditional Arabian style music while you play this well-designed game on any device! Start your Egyptian adventure on Scrolls of Ra Slot by selecting a coin value and Line Bet. Hit the Bet Max button if you wish to place the highest stake. Click on “Spin” whenever you are ready for the fun! Make the most of the Auto Spin feature which lets you select 5, 10, 15, 20, 25, 50, 75, 100, 200, 300, 400, 500, 750 or 1000 automated games. Bet Levels: Opt for 1 to 5 Line Bets. Amount of Paylines Selection: Adjust the number of paylines ranging from 1 to 20. Coin Values: As for coin values, they vary from £0.20 to £1.00. Wondering about the Ra Bonus Feature on Scrolls of Ra Slot? It becomes active when 3, 4 or 5 Ra symbols appear on the reels. During the feature, 25 treasure boxes are displayed. Choose 3 of them to reveal cash prizes. Don’t miss the traditional Egyptian symbols such as the Eye of Horus on Scrolls of Ra Slot! This icon represents Wild and substitutes for any symbol in winning combinations. It also triggers the Free Spins feature when it shows up in the middle position on the 2nd, 3rd and 4th reels. It expands and fills a reel while remaining in the same position during the 5 spins. Both Ra Bonus and Scrolls Bonus features can be activated during this round. 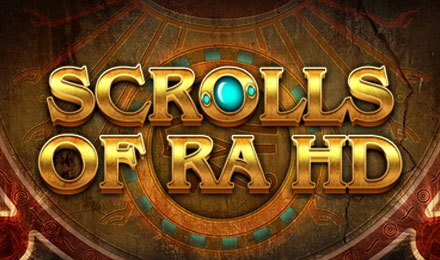 Have you noticed the Scrolls of Ra Logo on Scrolls of Ra Slot? It is the Scatter symbol which pays anywhere on the reels. All Scatter wins on the game are multiplied by the line bet. Don’t miss the unique Scrolls Bonus Feature! You can enjoy this round when the Scroll symbol appears on reels 1, 3 and 5. When it is activated, you can see 3 scrolls expanding to cover the reel. Pick one of them to reveal a prize. Here, you can trigger a maximum of 500x your stake!